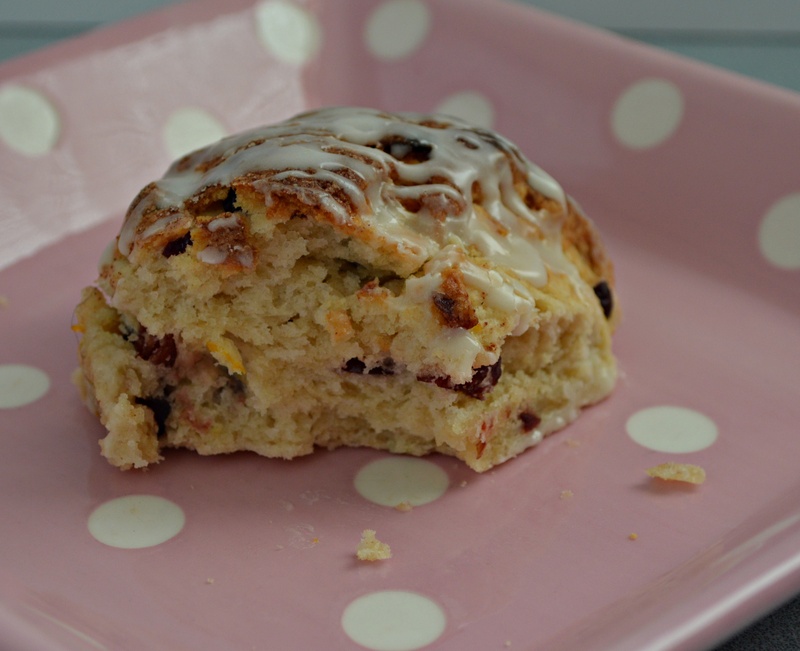 I love scones but I have a very hard time eating bakery scones. They are too big and dry. These are the perfect size and not the dried out bricks you may get elsewhere. Straight out of the oven they are soft and flaky with a bit of crunch from the cinnamon sugar top. A little bit of chew from the dried cranberries and a pop of flavor from orange zest. Add a simple citrus glaze and you have a perfect bite every time. 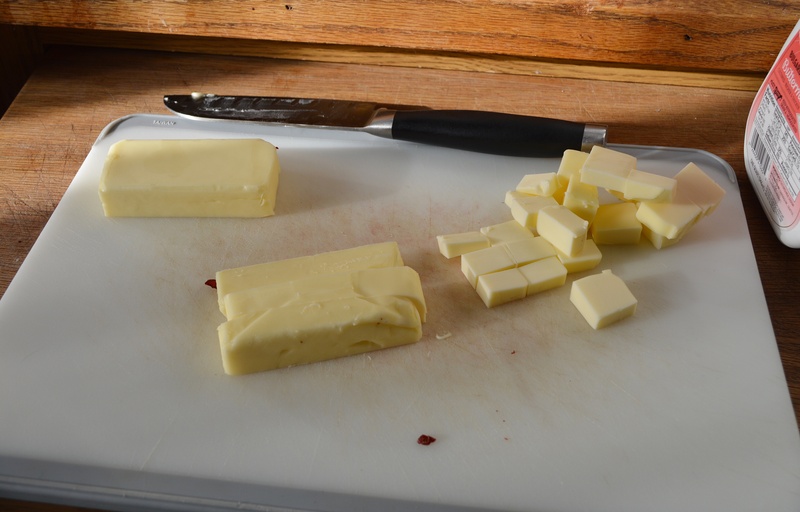 Start out with cold butter cubes. The easiest way to cube it is quickly cut it into sections and then small cubes on a cutting board. Quick and easy and the best way to ensure you are using cold, cold butter. Cut in the cold butter with dry ingredients. Stir in the buttermilk until just combined and stir in the zest and cranberries. Split the dough into two even balls and pat out into 6 inch circles on a floured board. Don’t mix the dough and definitely do not handle the dough too much. That’s where you get tough and dry scones. Cut each circle into six even wedges making sure to cut all the way through. 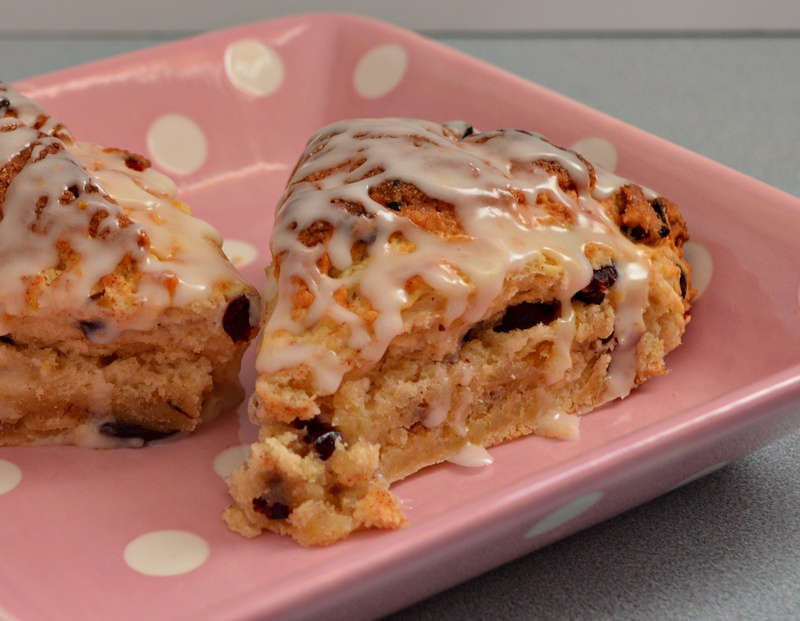 Place the scones on a lightly greased baking sheet. I use my baking stones so no greasing is necessary. I keep the wedges on the baking sheet exactly as you see above. The wedges will bake together a bit but it’s very easy to separate the pieces once done and frankly keeps the edges nice and moist. 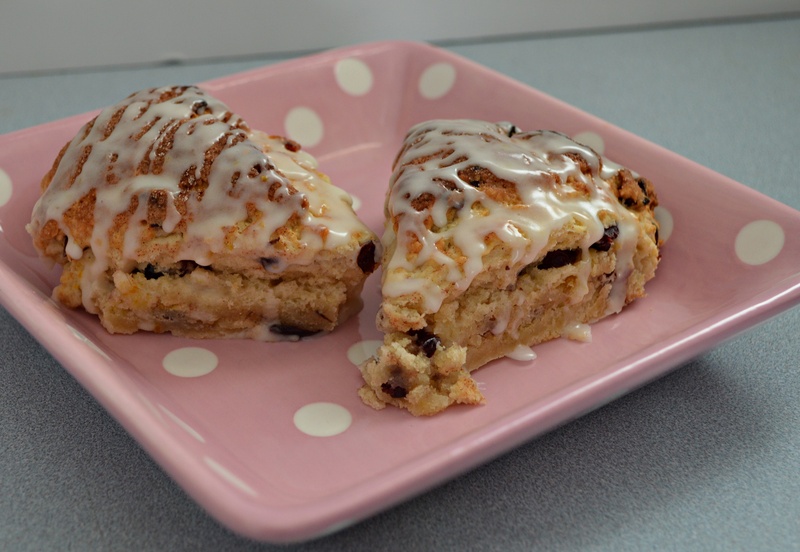 After the scones come out of the oven I separate them slightly and then drizzle the glaze over it. This way the glaze drips down the sides a little. Check out those bits of orange zest, yum! In a bowl, combine the flour, 1/3 cup sugar, baking powder, salt and baking soda; cut in butter. Stir in the buttermilk just until combined. Fold in the cranberries and orange peel. 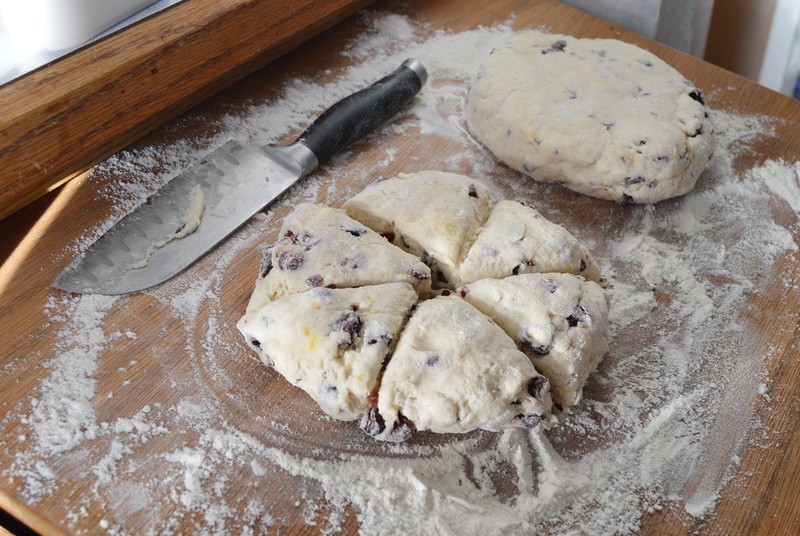 Turn onto a floured surface; divide dough in half. Shape each portion into a ball and pat into a 6 inch circle. Cut each circle into six wedges. Place on a lightly greased baking sheet. Brush with milk. Combine the cinnamon and remaining sugar; sprinkle over scones. Bake at 400 degrees for 15 to 20 minutes or until golden brown. Citrus glaze: Mix all glaze ingredients together. You want a fairly thick glaze that will drizzle off of a spoon. Separate wedges slightly and drizzle over scones.